Anyone with a smidgeon of games industry awareness cannot deny the huge impact and success games like PlayerUnknown's Battlegrounds (PUBG for short) and Fortnite have had over recent months, thanks to enthusiasm for this style of competitive online gameplay. EA and Activision are hoping to capitalise on the popularity of the Battle Royale FPS game mode/genre by leveraging their most iconic franchises. Shortly, these gaming goliaths will be entering the Battle Royale and both companies have recently shown off some teaser videos of the latest editions of their AAA shooter games, Battlefield 5 and Call of Duty: Black Ops 4, with this gaming mode shoehorned in. EA/DICE announced that a Battle Royale mode would come to Battlefield 5 back at E3. However, it didn't flesh out this announcement or even show us a logo, so there hasn't been much to go on about how it would fit into the game and so on. We know that the Battle Royale mode won't be available at the Battlefield 5 launch. Gamers will have to wait for a post-launch update. With Battlefield 5 EA is doing away with paid DLCs and Season passes for upcoming extra content but will sell cosmetic items in game and this seems to work well for Epic's Fortnite, so might be a great moneyspinner for EA too. 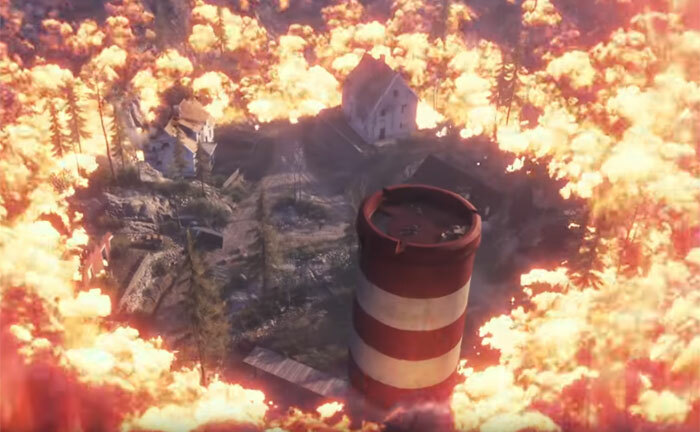 The video above shows the Battle of Rotterdam in Battlefield 5 with plenty of in-game fottage, prepared for Gamescom. If you skip ahead to 1 minute 35s in the video you will catch a very short teaser for the Battlefield 5 Battle Royale mode. It seems to show the competitive players battling it out in a landscape encircled by a blazing forest fire. Traditionally these games play out on a shrinking map, minimising any turtle/camping strategies, and keeping up the pace and pressure for intense combat. Battlefield 5 launches on 19th October, on PlayStation 4, Windows PC and Xbox One. Activision and Treyarch have confirmed that Call of Duty: Black Ops 4 Battle Royale multiplayer mode 'Blackout' will be available for the first time in the upcoming limited beta available from 10th Sept (PS4). Polygon expects this beta to be available for PC and Xbox One about a week later. This Battle Royale mode was previously announced back in May at the reveal event for Call of Duty: Black Ops 4. In this game mode players will have access to characters, weapons and (land and air) vehicles from the Black Ops franchise. "Players will fight on a massive map that includes familiar locations like Nuketown," says the source. Call of Duty: Black Ops 4 will be released on 12th October, on PlayStation 4, Windows PC and Xbox One. I love how the decades old last man standing game mode is now called battle royal just because of games like PUBG and fortnite, it's not a bad game mode for those who like it, but lets not deny the fact it isn't anywhere near a new thing at all. The problem with this game mode is that when the game is new and nobody knows the maps and tactics etc. then the game plays brilliantly and quite realistic(I had some of the best gaming moments of all time in the early days of PUBG), once the that wears off it just becomes a camp fest and the game goes stale (PUBG is now uninstalled). BFV dare I say, looks a little dull on the multiplayer side. I would have preferred a new BF Vietnam. Not bothered about a Battle Royale mode either.. I think Battlefield is going to struggle this year with Red Dead Redemption 2 coming at roughly the same time. I love how the decades old last man standing game mode is now called battle royal just because of games like PUBG and fortnite, it's not a bad game mode for those who like it, but lets not deny the fact it isn't anywhere near a new thing at all. Very similar to free-for-all modes of days gone by. I agree, it isn't anything new, just a variation of the mode. It will be fine - with RDR2 not coming out on PC I doubt it will impact sales too much - BF has always been a PC game really (it's terrible on consoles). I am looking forward to BF5 and I am curious about it's BR mode - it would be good if there was finally an alternative to PUBG on the PC (Fortnite really doesn't count given it's limited to TPP, which ruins the experience). I just hope they don't mess with the basic formula too much - the fact everyone is on the same footing at the start and the impact of loot RNG is really important for a BR game, so I guess we'll have to hope they have learnt from what PUBG has done. Cosmetics are fine we just don't want any paid boosts! On a side note I did play in the COD PC open beta last weekend and I was pleasantly surprised - it was actually fun to play for a few hours, so I might pick that up in 12-18 months time when the price drops to a reasonable level. It was fun but not worth £50 without a single player campaign…if there is still a sensible playerbase that isn't overun by hackers in a year, it will be worth picking up for £15-£20.